We're more than just cars! e're more than just cars! We are Ohio's great nostalgia museum. Our cars are displayed right alongside of thousands of unique pieces of historical memorabilia. The Canton Classic Car Museum has something for everyone. If vintage toys interest you, we have plenty for you to look at. From Tonka trucks to Hot Wheels to one-of-a-kind handmade whimsies, you'll certainly see some toy that brings back fond memories of when you were a kid. Maybe vintage advertising is more to your liking. The museum has hundreds of vintage and classic advertising pieces on display. From metal and porcelain advertising signs to boxes, tins, containers, and cans. You'll surely see something you'll remember from the good old days. We have several amazing and rare items from Canton's long-gone Meyer's Lake Park. Items like the Fortune Teller and the Monkey Band bring back memories of a much simpler, more relaxed time. 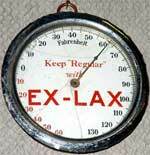 We have some very scarce political memorabilia throughout the museum. One especially interesting piece is pictured at left. 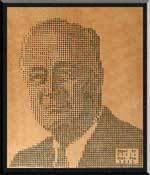 The portrait of Franklin Roosevelt was made on a typewriter by an inmate at the Ohio State Penitentiary in 1941. Other political memorabilia includes John F. Kennedy and Canton's very own William McKinley. Speaking of President McKinley, we have many McKinley items on display in our Canton Room. The Canton Room also contains thousands of pieces of memorabilia pertaining to the interesting history of our town. If Eastern culture interests you, you'll want to linger in our Oriental Room. Pictured to the left is a small portion of the treasures on display in this charming little room. The showpiece of the collection is the litter, designed so several very strong men could carry about somebody of great import. And then there are the quirky pieces that defy a 'regular' explanation. Such as the very 'moving' thermometer pictured at right. We hope that this very small sampling of our non-automobile offerings has piqued your curiosity. We look forward to seeing you at the museum!